Every time we google something, facebook someone, or just carry a phone, we create data. Yet, we do not benefit from this wealth of information as much as we should. Andreas Weigend-an advisor to Alibaba, BMW, Hyatt, MasterCard and Lufthansa, among others-wants to change that. 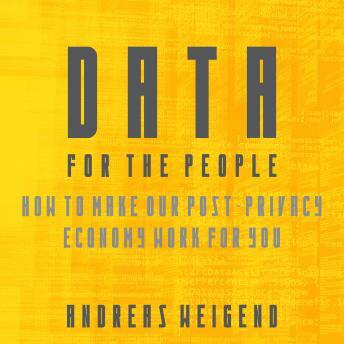 In Data for the People, he proposes six basic data rights that we all need to make better decisions. Big data is here to stay. The time has come to shift the balance of power back to the individual and find out how data is being used and what needs to change to make data work for you. Vital reading for anyone who owns a mobile phone, internet connection, or even a debit card, Data for the People puts the power of data back into our hands.